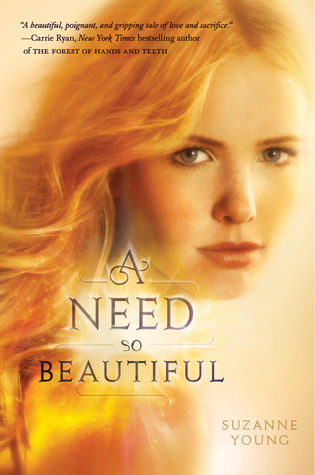 A Need So Beautiful is a heartbreaking and beautiful novel about a girl struggling to control a strange urge she gets to help someone in need. This might not seem like a bad thing; what could be bad about helping people? But in reality, this urge--the Need-- is, for all intents and purposes, killing her. And the people she loves are starting to mysteriously forget about her, one memory at a time. The worst part? Her skin is peeling off, and underneath is nothing but golden light. She’s forced to start lying and hiding, which causes her sweet-yet-almost-a-bad-boy boyfriend Harlin to get suspicious and hurt. But Charlotte can’t tell him what’s going on, she can’t tell anyone. Only Monroe, the doctor at the clinic Charlotte volunteers at, seems to know what’s wrong with her. My first thoughts: This. Novel. Is. Amazing. Suzanne Young wrote a novel that plays with your heart strings as you read, emotionally pulling you in every direction. I kept turning the pages, hoping that Charlotte would find a way to make everything work out, so that she could keep her life with her friends and family, and with Harlin. They were so perfect together! The concept for A Need So Beautiful is very original and exquisitely executed. Would this be considered an angel novel? I’m not entirely sure, but either way, A Need So Beautiful is now one of my favorites! Harlin was, without a doubt, my favorite character. Despite the idea that he would be a don’t-give-a-crap-about-you bad boy when we were first introduced to him in the story, he turned out to be a loving and caring boyfriend who put Charlotte’s safety and wellbeing at the top of his priorities. The story starts after they’ve already been dating for quite some time, which was actually refreshing to read seeing as Charlotte’s focus wasn’t on getting his love, but rather keeping it. A Need So Beautiful is definitely a recommended read. It’s relatively quick and oh so heart-wrenching. I give it 5 out of 5 stars. I've read some really glowing reviews about this one and yours seems no different. I can't wait to me Harlin and Charlotte. Thanks for the great review!